In line with the reformulation and rebranding of many of their most popular scents, Dior has just launched their new look Dior Homme Sport, an energising and fresh fragrance. The more elegant look of the new Dior Homme Sport has been achieved with a darker colour juice reminiscent of the original Dior Homme, together with sleek silver packaging. The fragrance has been adjusted just slightly to accentuate iris, the signature note of Dior Homme, while the top notes of Sicilian Citron and Ginger, and the dry down of Virginia Cedar Essence, remains just the same. 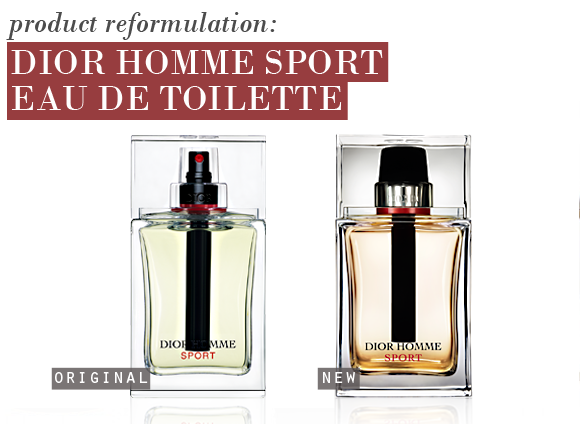 To clarify, when you order Dior Homme Sport from now on, you’ll be receiving this brand new version! This entry was posted on Tuesday, June 5th, 2012 at 8:00 am and is filed under Fragrance, Men, Special Post. You can follow any responses to this entry through the RSS 2.0 feed. You can skip to the end and leave a response. Pinging is currently not allowed. So fed up with all Dior’s reformulations and not changing the name. As a big fan of Miss Dior Cherie I cannot stress enough the useless confusion recently done in names and formulas, not to mention Miss Dior, l’Originale and so on. Miss Dior is only one, why label it with one more word, l’Originale? If you want it t be the original one, leave as it is! Totally desagree with this new idea lounched by the “nose” who changed everything. To me it looks more like a commercial thing, I could not see the necessity, everything was clear and made sense before all the changes.Poor Mr. Christian Dior..Babs from Madrid.